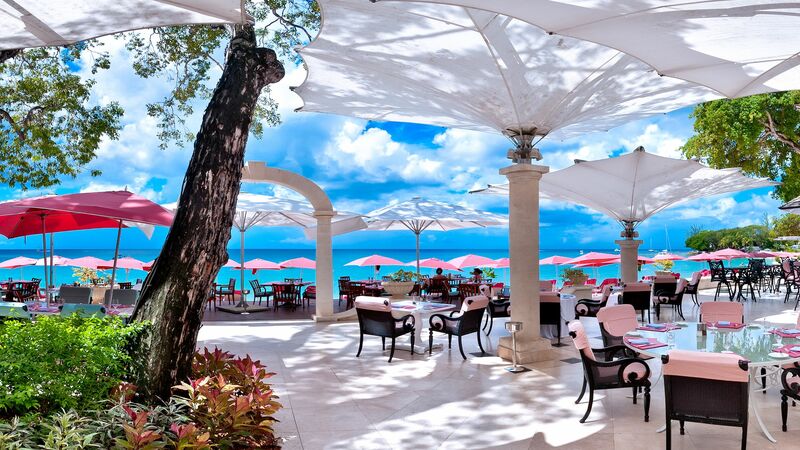 Sandy Lane is an idyllic hotel set on the beautiful white sands of the beach, overlooking the sparkling Caribbean Sea. It’s home to excellent amenities and facilities, including a spa with a large menu of treatments, opulent guest rooms, and activities for everyone. There is a large swimming pool with a waterfall and Pool Bar, as well as plenty of opportunities to relax. Families can choose to stay in the family suites, as well as enjoying child friendly menus in the restaurants. There is also a children’s centre with a teens’ room and a daily programme of events. Adults can play tennis, try the water sports directly from the hotel, or choose from one of three professional standard golf courses. 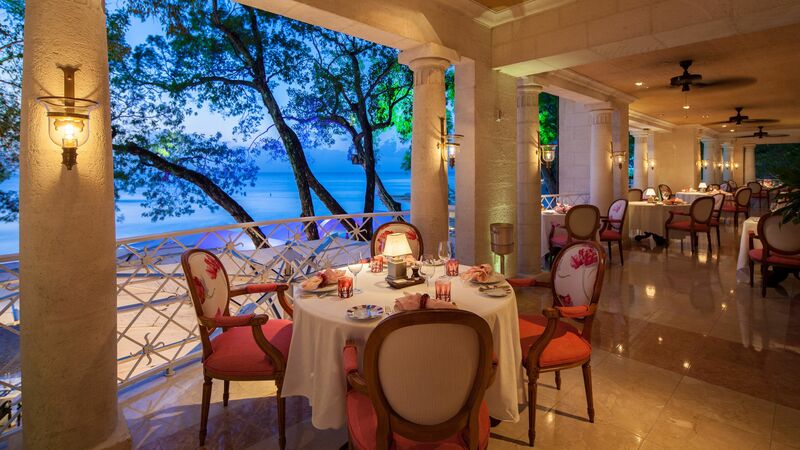 The options are endless in the luxury Sandy Lane hotel. Child prices apply to ages 3–14 years. The hotel has 112 rooms and suites. Take in views of the sea from this spectacular outdoor terrace where you can choose from French and Mediterranean dishes, expertly paired with delicious wines. Dishes include lobster bisque, slow braised short ribs, prime aged steaks, risottos and much more. Dine by the beach amid Sandy Lane’s beautiful gardens and choose from European, Caribbean and Asian dishes with a twist. Enjoy Sunday brunch, themed buffet evenings, a sushi station, afternoon tea and more. Speciality dishes include Scottish smoked salmon, flatbread pizzas, fish of the day, spicy tuna norimaki sushi and grilled tiger prawns. 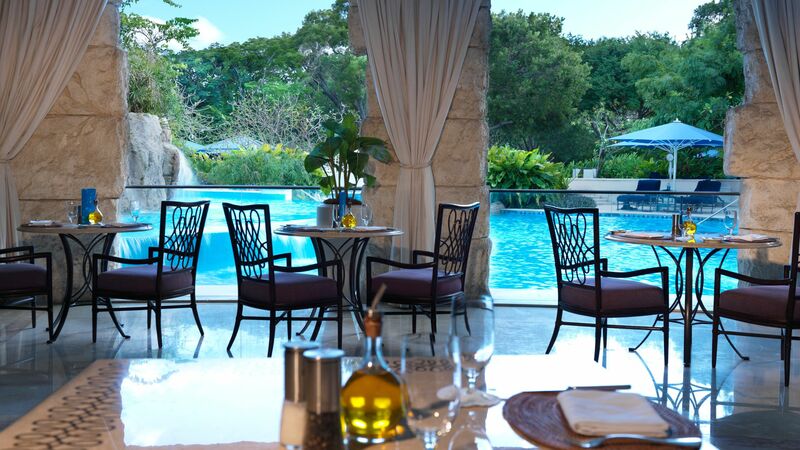 Overlooking the swimming pool and its waterfall, the Spa Café offers light bites and snacks throughout the day. Enjoy the relaxing atmosphere as you select delicious dishes including gazpacho, sushi, burgers, catch of the day and chicken satay. 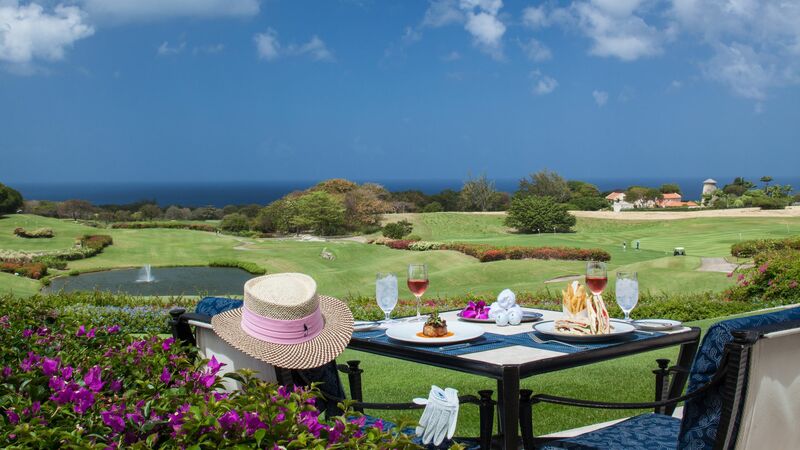 Look out over the bright greens of the hotel’s luscious golf course leading down to the bright blues of the Caribbean Sea as you taste delicious dishes from the menu. Dishes include a hole in one salad, Bajan flying fish sandwich, fish and chips, shrimp tempura and succulent meats. 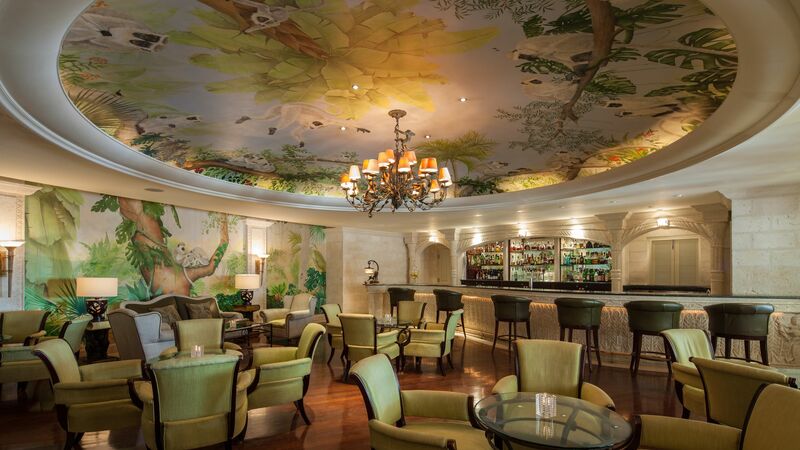 Enjoy monkey themed murals and a quirky setting for pre-dinner or after dinner drinks, including cocktails, wines and spirits. Canapés and small bites are also served alongside. Enjoy a refreshing al fresco drink beneath the beautiful mahogany trees and choose from a menu of fine wines and cocktails, as well as hors d’oeuvres. This cosy bar with rich wooden furnishings is the ideal place for wines and cocktails in the evenings and light refreshments close to the beach. This is the ideal place to watch the sun set over the white sands and glittering Caribbean Sea. Choose from spirits, beers and cocktails throughout the day. Choose from teas and coffees, smoothies, juices, gelato and other light snacks and refreshments during the day. Choose from the swim up bar or al fresco seating area and enjoy a menu of light refreshments and lunches all day. Choices include soups, salads and sandwiches, as well as Caribbean dishes. Overlooking the golf course and offering spectacular views, this is the ideal place to relax in style after a game. Located on the white coral sands of the Caribbean beach, enjoy free umbrellas and sun loungers from the hotel, as well as lounger service. Order drinks, sorbets, snacks and cold towels straight to your lounger or try some of the water sports. 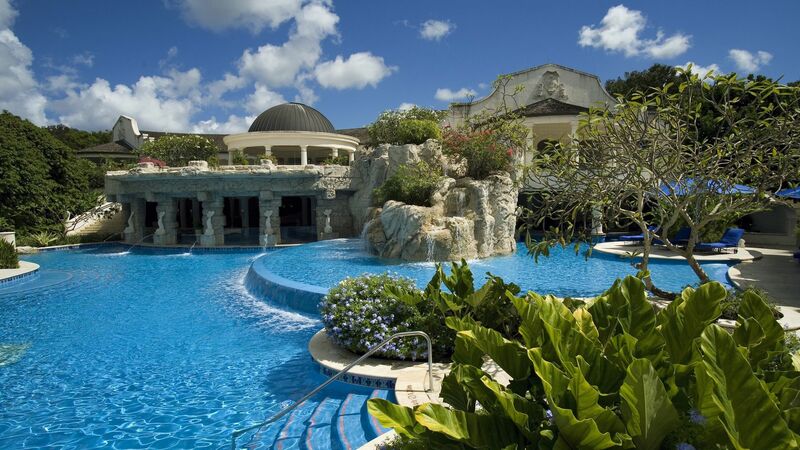 Sandy Lane’s swimming pool stretches out over 690m² and has a cascading waterfall surrounded by sun loungers, a terrace and beautiful gardens. 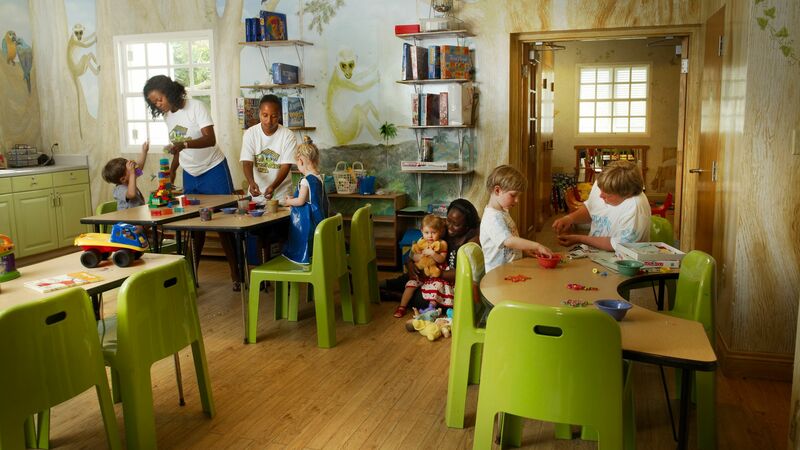 The hotel’s children’s centre is home to fun activities and amenities for guests of all ages. There is a daily activity programme, a playground, movie nights, parties and more. Kids can learn to play tennis, sail and more, while teenagers can enjoy the Den and its jukebox, computer stations and TVs. The hotel’s bright and elegant marble spa offers a range of treatment options at the hands of highly trained therapists. There is also a shower circuit, sauna, crystal cold room, steam bath, hydrotherapy and more. Book personal training sessions at the hotel’s onsite fitness centre and keep active or build a personalised programme. There are also free weights, cardio machines, yoga and pilates classes, spinning classes and more. There are three golf courses to choose from at Sandy Lane, designed by expert Tom Fazio. Old Nine Course has 9 holes and offers small greens and tight fairways for a challenge. 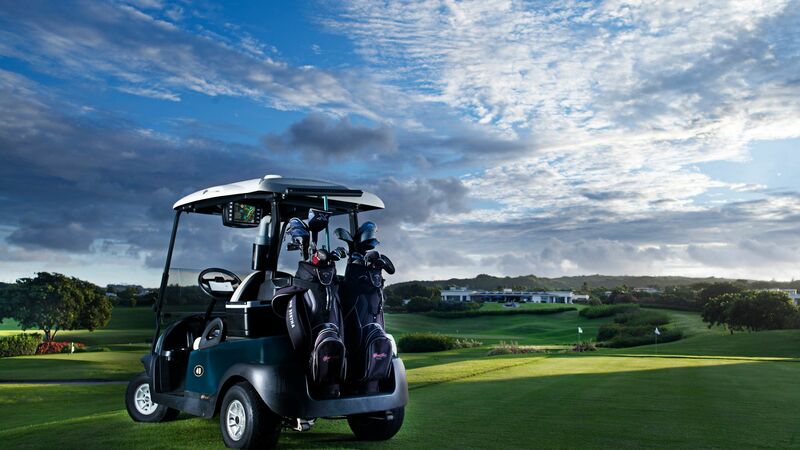 The 72 par Country Club Golf Course has 18 holes and beautiful views of the Caribbean Sea, as well as previously holding the 2006 World Golf Championships Barbados World Cup. Alternatively, Green Monkey is an exclusive 72 par course carved from an old limestone quarry. 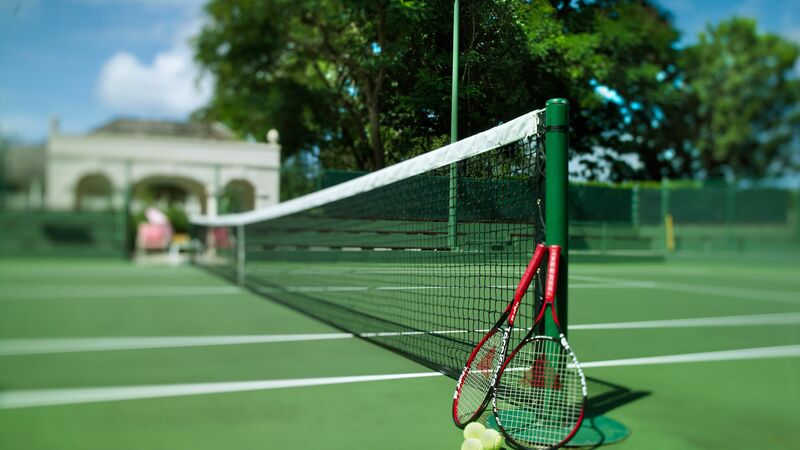 There are nine floodlit tennis courts to choose from at Sandy Lane, with tennis lessons available and equipment to borrow from the hotel. Choose from a wide range of water sports and activities at the hotel’s beach. Guests can enjoy sailing, scuba diving, kayaking, banana boat rides and lots more. 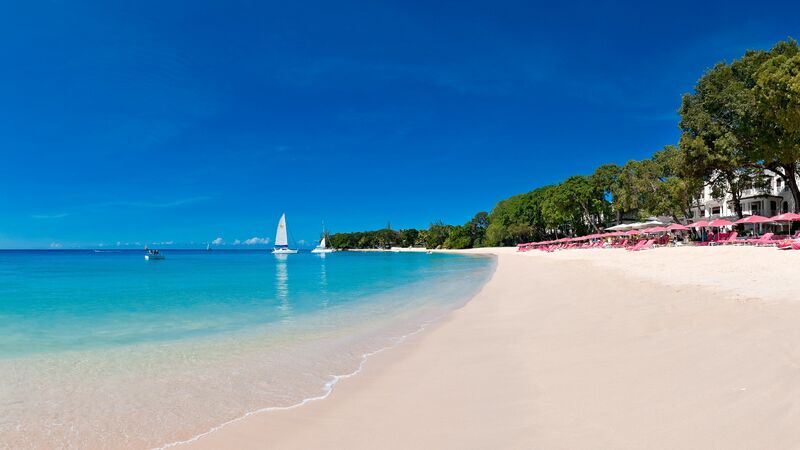 Located on the sands of a pretty cove along Barbados’ west coast, Sandy Lane Hotel is ideally situated for those wanting to enjoy the island’s beautiful surroundings. There is a white sandy beach perfect for those wanting to soak up the sun, as well as tropical gardens full of luscious plants, trees and flowers. Try some of the water sports and explore the area by boat or go sailing on your own. You can also book scuba diving trips and explore the underwater world of the Caribbean Sea. Golf, tennis, and horse riding are all available in the surrounding area, or you could head into Holetown, which is just minutes away. Here you’ll find lively bars and restaurants where you can sip a cool beer, or try some of the delicious local cuisine. These lavishly decorated rooms have everything you need for a comfortable stay. There is a separate bedroom with a king size bed, patio with furniture and beautiful views of Sandy Lane’s gardens from the large terrace or balcony. Guests can also enjoy double sinks, a separate bath and shower in the en suite bathroom. 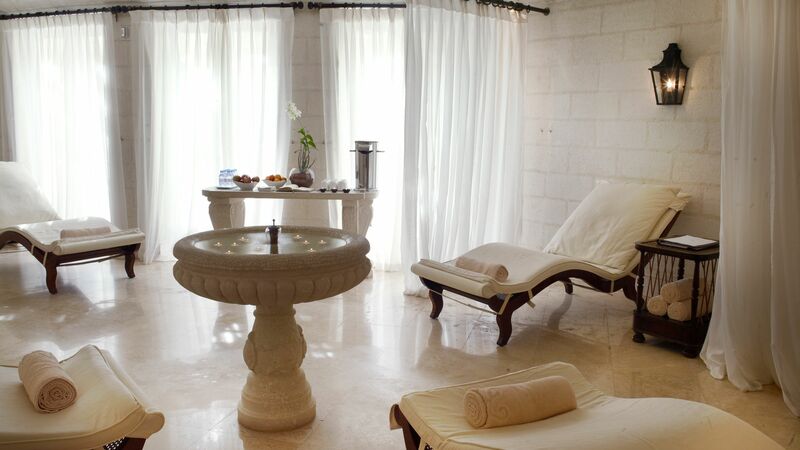 The spacious rooms are opulently decorated to suit the style of Sandy Lane Hotel, with luxurious details and amenities. There is a separate bedroom with a king size bed, patio with furniture and beautiful views of the sea. Guests can walk straight to the beach from their patio and there is also a large en suite bathroom with a separate bath and shower, and double sinks. Located in the exclusive Dolphin or Seahorse wings of the hotel, these spacious rooms offer elegant furnishings and excellent amenities. There is a large bedroom with a king size bed, desk, TV, dressing table and seating area, while outside you’ll find a well furnished terrace or balcony with views of the white sandy beach and sparkling ocean. There is also an en suite bathroom with a double mirror and separate bath and shower. The large two bedroom suites offer opulent décor and an exclusive position, with a spacious balcony or terrace offering views over the hotel’s gardens. There is also an elegant living room, master bedroom with a king size bed, second bedroom with twin beds, and the opulent décor of the hotel throughout. Guests can also enjoy a walk in wardrobe, large bathroom with two sinks, a bath and separate shower, and a powder room with a WC and bath. Decorated with lavish colonial furniture and furnishings, these spacious suites have a large living room and dining room, comfortable patio and a bedroom with a king size bed and desk. The patio offers beautiful views over the white sandy beach and sparkling Caribbean Sea, and there is a walk in wardrobe and a large bathroom with a spectacular bathtub, separate shower and two sinks. These large suites are ideal for families and have opulent décor throughout. There is a master bedroom with a king size bed, a separate bedroom with twin beds and a large living room and balcony or terrace. Guests can enjoy views of the Caribbean Sea from the balcony or terrace and wonderful amenities throughout the suites. There is also a powder room with a WC and bath, and an en suite with a separate bath and shower and two sinks. These luxurious two bedroom penthouses are ideal for small groups or families wanting to enjoy the very best facilities. There is opulent décor throughout the penthouse, as well as a master bedroom with a king size bed, second bedroom with a king size bed, a study, dining and seating area and two patios with views of the hotel’s tropical gardens. There are also two large bathrooms with dual sinks and separate baths and showers, and walk in closets. “ Not what you expect - it's better! So many people had told me that I would love Sandy Lane but for years I was somewhat sceptical. I have never been the biggest fan of the Caribbean, preferring more the warmth of Asia and style of the South of France. To me Sandy Lane conjured up images of stuffy staff only interested in their celebrity guests and a constant pressure to be pristine and picture perfect at all times. How wrong could I have been? So wrong indeed. From the moment you arrive at the airport and are whizzed through security to being greeted personally by the general manager on arrival in the hotels reception, you can't help but smile. The friendliness of the hotel was what overwhelmed me - staff say hello to you, guests say hello to each other! We arrived strangers and left feeling part of a club of old friends. I cannot put my finger on what it is that sets this hotel apart from others but let me give you a few pointers : - The rooms: these are well maintained and perfectly appointed in colonial style, every need has been thought about. We stayed in the Orchid Wing in a two bedroom suite and I can honestly say it is the best hotel room layout I have come across for a family, with a long hallway and lounge between the two bedrooms allowing parents peace and privacy from their children. - The staff: From housekeeping to masseurs to kids club, every member of staff will greet you personally and make you feel so welcome - Kids club : It is very rare to find a safe haven for children where they drop in as they like to join an activity or just chillax. The autonomy given to the slightly older children around the resort is a wonderful thing to behold. Watching ten year olds take tea with their friends without the need for parents, I could see made them feel so grown up. Yet you could see staff all around the resort keeping an eye on the children to ensure they come to no harm - Restaurants : we stayed on a half board basis so ate at the hotel most nights. The fine dining restaurant being our favourite was up there with some of the London restaurants we frequent. We loved the way they would make almost anything for our children. - Pool :Foam floating beds and a waterfall make this an incredibly relaxing environment. - Spa : Very impressive with top notch treatments carried out by professionals. - Relaxed friendly atmosphere: unlike my unfounded expectations, you are not on show here. Service is super efficient and friendly to all. Guests get to know one another at the weekly Managers cocktail evening. Everyone is super friendly and relaxed. I could go on but suffice to say before we had even left we were talking to our travel agent to get a reservation for next year. We can't wait to return. Here you really do get what you pay for and more. I came to Sandy Lane Hotel for afternoon tea. Its' entrance is imposing, befitting of a Barbados institution. It has a celebrity clientele ( although I never met any) but they made ordinary patrons like me feel very welcome without any stuffiness. Heads up to Tammi, you served me perfectly. Just enough attention to feel cared for but not too much so as to appear false. There was an excellent selection of teas but when the food was beautifully presented on a cake stand, I did think, secretly, that it didn't look a lot. I did,however- pardon the pun- eat my words. The delicacies were exquisitely constructed and I have to say, I failed to finish. The scones with Clotted Cream and Jam were whisked away and deposited into a Doggy Bag for me to enjoy at home. There were restrictions on areas where non- residents could go but I appreciate that is in place to protect the privacy of residents. All in all, I had a very pleasant afternoon, which is what it is all about. For the price I paid, so not happy with my experience. Chad is great. As are the areas you can splash and get into the hot and cold pools. I asked for a deep tissue sports massage. It was so not like that. Then a manicure that my daughter could have given me. Will not recommend, sorry. Beautiful room with a great beach adjacent. Played golf also which was awesome... Especially the par 3 from the elevated tee. Highly recommend this spot if you are looking for a first class stay. Rent yourself a mini moke to sight see around the less traveled spots on the island.